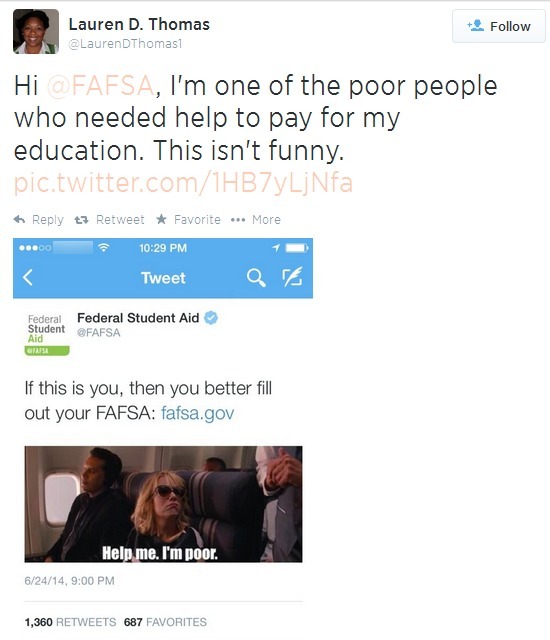 The last official tweet before FAFSA's deleted poverty mocking tweet encourages users to interact with them via the #AskFAFSA hashtag. Should this story pick up tomorrow, under the bright day's sun and "Hump Day Hubbub" the folks over at Federal Student Aid may be in for more than they bargained for! 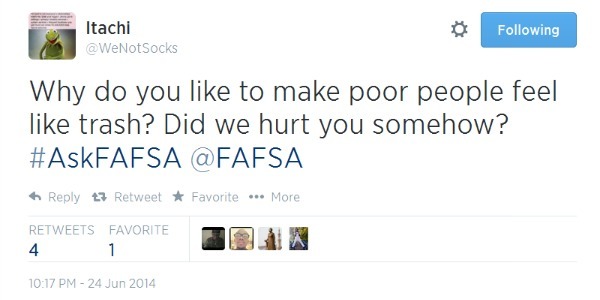 Currently, they're advertising an #AskFAFSA Office Hours at 5PM on June 25th, and I'd encourage everyone offended by their tweet to #AskFAFSA why they think it's okay to make fun of the poor?! 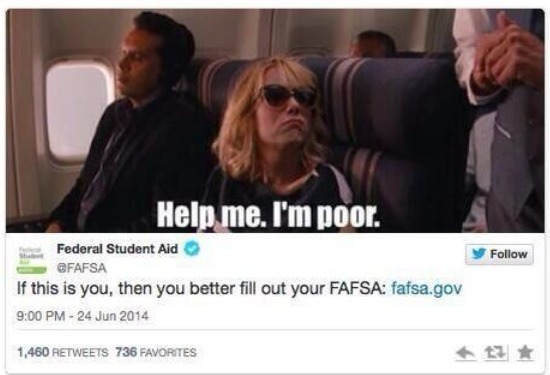 Whomever is behind this "let's make fun of poor people" campaign needs to be held accountable, and since I'm a concerned taxpayer, I want answers and I'm going to go see if I can find some by contacting FAFSA directly. As a former federal employee and tax payer, I'm angered at the government's lackadaisical social media policy, if one exists, and the recklessness with which they allow their employees to tweet on their behalf. Making fun of the poor is not funny, and it especially shouldn't come from government employees, acting in an official capacity on the taxpayer's dime! As a Social Media Specialist, this also makes me shake my head in disgust because it highlights an issue that many organizational leaders just don't get (until it's too late, since many prefer to be REACTIVE, rather than PROACTIVE), and that is: HIRE A TRAINED PROFESSIONAL TO MANAGE YOUR SOCIAL MEDIA! And yes, in this day and age where "everyone has a smartphone" and a Facebook account, some will mockingly suggest that "anyone can manage your social media", but we see, in times like this, as well as with other failures like United Airline's recent flub with sending an X-rated photo to its followers, that not just anyone can or should be in charge of your social media marketing! I like to use the analogy that putting someone in charge of your social media because they're "young" (based on the presumption that they "get technology" simply because they are young), is the equivalent of putting a newly minted 16 year old driver behind the wheel of an 18-wheeler truck! Yes, they've been taught to drive, but they're not ready to handing an 18-wheeler, and when you use social media on behalf of a BUSINESS, you're dealing with a TRUCK and not a MiniCooper! 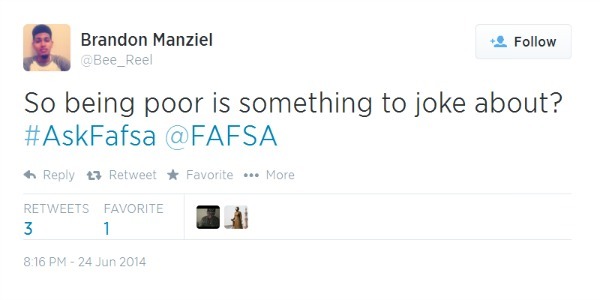 There's more at stake and more on the line for organizations and businesses, and as such, they need to be more proactive to protect their name and their brand from senseless acts of recklessness like this FAFSA poverty mock, which can be easily avoided with the proper Social Media Policy in place and a Social Media Marketing Plan. James W. Runcie is the Chief Operating Officer of Federal Student Aid, and he works in UCP (Union Center Plaza), Room 112G1, 830 First Street, NE, Washington, DC 20002. It looks like his phone number is: 202-377-3003 and his email address is: james.runcie@ed.gov. The Internet tells me that Nicole Callahan is the "Digital Engagement Strategist – U.S. Department of Education's office of Federal Student Aid". She write's for the "Official Blog of the U.S. Department of Education", and her LinkedIn profile says she interned with Federal Student Aid for a year before becoming their "Digital Engagement Strategist" 3 years ago. She's also on Twitter: @NACallahan, and it looks like her email address is: Nicole.Callahan@ed.gov. So to recap: Don't mock the least vulnerable among us while trying to be pithy on the web! 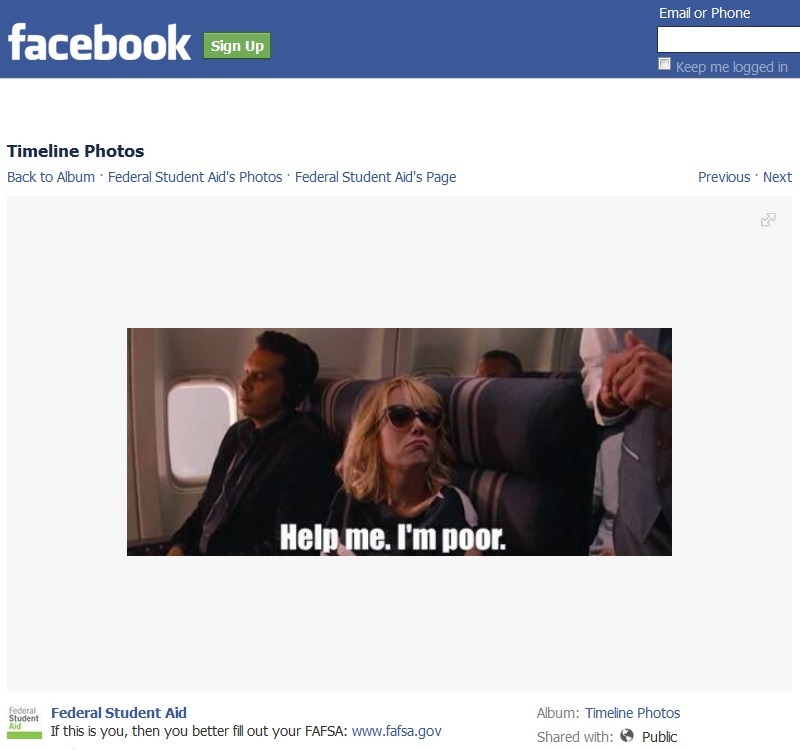 Note: At 11:54PM CT FAFSA posted an apology tweet and later deleted the image from their Facebook album (though you can see a screen capture of it below). This isn't good enough for me. I'd like to see their Social Media Policy, and learn about their department's training for employees that manage and monitor these accounts to make sure this doesn't happen again! As a taxpayer, I have the right to request this information. I'll report back later with what I find! A few years ago, I was asked to put together a piece that ultimately was titled “10 Things College Students Need to Know About Social Media”. Today, when I go back and revisit that piece, I see much of the information is still relevant, so I wanted to bring this topic up again, and add a few extra tips. Be Friendly, Look Around, and Stay Engaged: Do a little research and watch how people interact with others, then jump in and join the conversation! Comment on blogs, make @replies on Twitter, and introduce yourself to someone via Facebook, follow interesting folks on Instagram, Pinterest, or Tumblr based on the topics you like. When you speak for the first time, say “Hi (insert their first/user name)” and mention something that is an area of interest for them and highlight your mutual interests. Remember, most people’s favorite word is their own name and their favorite topic is themselves. Choose Your Network and Friends Wisely: While it’s great to connect with people and actively engage with them, know that everyone isn’t going to be your friend, nor is their worth to your network the same. Don’t just add friends to have a huge friends/followers list. Work on having a connection that matters and make the investment in your network by choosing members carefully. Plus, currently it looks as though there’s likely going to be a long-term benefit to doing this, now that some companies are using your social media networks to determine your creditworthiness based on your friends’ payment histories. Follow Up: Your word is your bond, even in social media. If you say you’re going to do something: Do it! If you can’t meet a deadline, make an appointment, or keep a prior commitment: Let people know that in advance. Also, if someone says they’ll get back to you, or that they’d like for you to get in touch with them at a later date: Send a reminder and follow-up to make sure you don’t get misplaced from someone’s busy schedule. 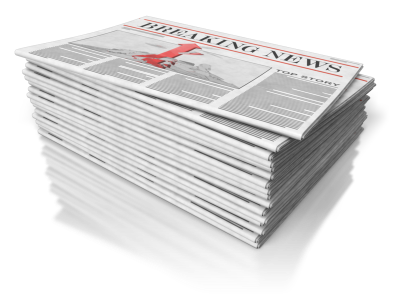 Apply the “Front Page of the Newspaper Test”: Though the concept of newspapers and the physical front pages of them are becoming an antiquated idea, the concept of “The Public Eye” is not. While the throng of “reality TV shows” would have you believe otherwise: “all news isn’t good news”. Before you publish something online to a social media outlet, think “What would my mom/dad/loved one whose opinion I really respect think if they saw this?”. Also, it’s not a bad idea to ask: “What would this look like if it were broadcast to the world?”. If it’s something that can be taken out of context, or make you look bad to potential employers or clients, think again about posting it. Know that nothing is “private” if you put it out there, regardless of whatever “safety controls” that are offered on various social networks. If it’s there, it can be leaked, so if you don’t want EVERYONE to know something: Don’t post it! Google Yourself and Protect Your Reputation: Censor yourself (see #4) and edit as necessary. Consider the fact that everything you do, say, or upload to the internet can be archived and potentially displayed in perpetuity (i.e. forever), so remember that when you upload content and make comments. Google yourself once a month and see what others are finding out about you. Use Google Alerts to monitor your name on the web and receive email alerts whenever you show up in a search result. Take Control of Your Personal Brand: Purchase your name as a domain name now if it’s available, and stake your claim to your name on all the social media networks. Get control of the information that’s on the web about you, and do that by strategically posting comments on blogs, engaging in online communities, and being mindful about what people can find out about you by doing a Google search. As time progresses and you work on making more of a name for yourself down the road, you’ll appreciate having been proactive about your personal brand and the image you project to the online world. FYI: Social Mention (when it’s working) does the same as Google Alerts, but across the social web. Promote Yourself and Others: Start a blog hosted on your domain name, and start building your personal brand early. Include a nice, smiling photo of yourself, and lots of information about who you are on the “About” page, in addition to highlighting the best way for people to get in touch and connect with you. Do a Twitter Search for a topic of interest to you, and find like-minded people, join related online communities, and comment on their blogs. When you see something you like, promote it and tell everyone why you love it! Get LinkedIn: LinkedIn is a great resource and provides a vast professional network that can mean job opportunities, internships, mentoring, career advice, and entrepreneurial opportunities. Fill out your profile with “future-oriented language” highlighting how your past experience has prepared you for future successes. Join Groups and send personal messages when you invite people to join your network. Put in a little effort and show that you know a little about the person, and highlight some areas of interest you both share. Be Flexibly Adaptable: As soon as you master one social media platform, it will surely change, so continue learning and surveying the landscape for new developments in social media. Find out what others are using and why they like it, and always be willing to try new things. Don’t Rely on Reputation Management Services: Over the past few years, I’ve seen a surge in the number of companies (and subsequent web and TV advertisements) promoting “reputation management” services. Now, I admit, I haven’t tried any of them, but the basic premise of how they work seem to be flawed, as they aren’t doing anything that ultimately you can’t do yourself, with some time and a bit of research. I wouldn’t pay someone THOUSANDS of dollars for whatever services they’re offering. Also, as I watch these commercials, most of these companies really do come across as “wolves in sheep’s clothing” preying on people that don’t know much about technology and for those whom a “reputation management service” sounds like it could be offering a good deal. Ok, before I get off on a tangent, let me reiterate my point: Don’t rely on a reputation management company to correct any past mistakes you’ve made online, because for the most part, deleting things from The Web isn’t really effective. It’s likely been archived, saved, documented, or even screencapped by someone else, thus be wary of companies that are offering to improve your reputation, especially since some of them are suffering from black-eyes to their own reputation. Learn the Networks and Use Them to Your Advantage: The great thing about social networking as its flourished over the years is that it’s easier to find your niche and others that are into what you like. In fact, now that social media has started to mature, you can actually see what networks are best for whatever you’re seeking to accomplish. For instance, Facebook has a tendency to be the people that you already know and are connected to via some real-world connection, either via past school, church, or job-related activities. Twitter, on the other hand, is filled with celebrities and people connecting in real-time across the globe. LinkedIn is more “professionally-focused”, as its users tend to be business-oriented in their interactions and connections, and Pinterest, Tumblr, and Instagram are all very popular with the creative arts crowds, as Pinterest attracts folks into pictures and collages, Tumblr works to be the be-all for shared media content, and Instagram continues expanding its reach moving from pictures into video. In all, each network (and there are way more than this for sure), has its own audience and people that gravitate towards it. The best advice here would be to note what interests you, and then figure out which network is going to be the best tool for connecting you with like-minded folks! Think Long-Term: College is 4-6 years of fun and learning, but don’t forget to keep your end goal of being prepared to handle all of the responsibilities of adult life in mind in all of the decisions you make. Make social media choices that you can look back on years from now with a fun and familiar grin, instead of a shameful chagrin. Hope all this information was helpful. Let me know what you think, and if you have any other tips for looking professional in the online arena? Leave a comment below or fill out the contact form. You can also find our automated social media news stream on Twitter @sss4success. Even with the proliferation of news media outlets reporting record uses of technology and social media and tons of success stories of how smaller organizations are able to use social media to increase their bottom line, there are still some people “on the fence” about whether or not social media will work for them and their company (Check out this cool infographic on How Small Businesses Are Using Social Media). 1. Stake Your Claim: Grab your name on all of the social media networks out there (e.g. Facebook, Twitter, LinkedIn, Google+, etc.). It’s always better to be safe rather than sorry and risk losing your name to someone else who picks it up once you’ve become popular. Also, if you grab a name, like a Twitter account, but don’t intend to use it that often, note that on the profile, and tell your visitors the best place to find you online. 2. Make It Look Professional: If your goal is to lead people to your company’s website or blog, make sure it looks professional and is user-friendly when visitors arrive. You only get one chance to make a first impression. If visitors check out your site once and don’t like it, they likely won’t return again. 3. Try It for Three Months: Start with 3 months of content to give yourself an opportunity to learn the tools and how best to use them, and to figure out some of the better strategies for engaging your audience in the social media space. 4. Review Your Analytics: After the first three months, have a look at your web and social media analytics and decide what they’re telling you. I suggest you only look at your analytics AFTER a few months have passed, because it will drive you crazy to look at them on daily or weekly basis, especially since you likely won’t see much change in the early days. 5. Repeat Step 3 for Another Three Months: Building relationships and capitalizing on the widespread popularity of social interaction for business use is something that takes time. Let your first three months be the “test case” for whether or not you can handle adding a social media marketing strategy to your marketing mix, and finding out of social media venues truly work for your brand and your customers. Also, be prepared to tweak things here and there as the need arises. Now’s the time to ask yourself a few questions: After three months, can you see the potential of where this can lead? Have you uncovered some new information about yourself, your customers, or your competition that can give you the edge for how you market to your customer base? Can your business afford not to be engaging customers in some capacity on social networks, given the millions of people that roam the web every day? At the end of the day, you don’t want to miss the opportunity to be proactive in marketing your business online. At the very least, give it a six-month concerted effort and see if it’s for you. And don’t, I can help. Feel free to use me as a resource, either for Social Media Training (where I show you how to use these tools for yourself) or Social Media Consulting (where I use these tools on your behalf). Fill out the Contact Us form to get started. 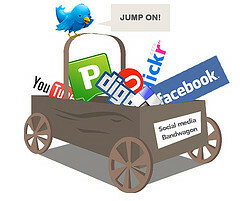 What’s stopping you from using social media in your small business?